In celebration of the 2017 Philippine Arbor Day, Sagittarius Mines, Inc. organized and sponsored a Tree Planting and Nurturing Activity in Tampakan Central Elem. School (TCES) in Poblacion, Tampakan, South Cotabato on June 23, 2017. The activity was participated by 430 pupils and teachers. 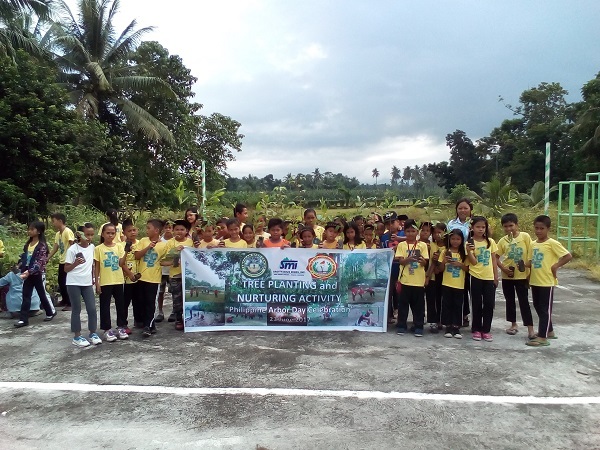 SMI Environment staff together with eleven (11) Mindanao State University (MSU-Gen. Santos City) Agricultural Engineering on-the-job-trainees/students assisted the elementary pupils and teachers during the activity. A total of 500 hills Tuai (Bischofia javanica) and 500 hills Mangium (Acacia mangium) seedlings were planted on its school grounds. More than 200 previously planted seedlings were also nurtured on the said activity through weeding and pruning of branches to make the planted saplings attain a straight bole.